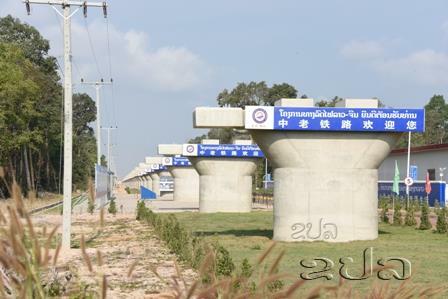 (KPL) Laos-China Railway Construction Project stretching from Bohan-Boten (Laos-China border) to Vientiane Capital has been actively implementing and had a satisfactory progress, which is 16.4 percent complete and expected to complete as scheduled by the end of 2021. Over the past two years, sub-contractors completely drilled 53 channels passing through mountains, built 36 bridges with a total length of 54,000 metres, cleared land for building roads access to construction areas with a total length of 800 km, installed transmission line with over 400 km stretch and 233 transformers and built 93 km long of water supply. China Railway No 2 Engineering Group Co., Ltd. a subcontractor in the sixth section of railway construction running 65.7 km from Phonhol district, Vientiane Province to Vientiane Capital which its framework consists of a 51-km infrastructure construction, construction of 17 bridges and four stations, has completed to install 130 poles and expected all poles to be installed by middle this year. Laos-China railway with a total stretch of 417 km is a top-standard single track, which designed operating speed of 160 km per hour. A combined investment of the railway is US$6 billion and the construction work kicked off December 2 2015, a part of celebration of 40th anniversary of National Day. This is the biggest investment project of China in Laos so far. The project, under “one belt, one road initiative” will be a significant part of socio-economic development of Laos to be grown and moved upwards. Laos and China is a shared plight community that existed a mutual trust under Laos’s strategy to turn land-locked country into land-link.